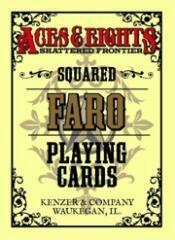 This 54-card deck recreates historic 19th century playing cards of the Wild West, right down to the smudges and grime from long use gritty realism at its finest! This deck is a perfect companion to the Aces & Eights RPG, where you often use a deck of cards to determine random outcomes. Of course, whether you use this vintage deck for faro, poker, or any other game, you'll see that it offers a period feel no other playing cards can match!